P0955. 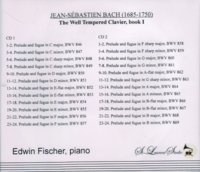 EDWIN FISCHER: Das Wohltemperierte Clavier, Book I (Bach). (Canada) 2-St Laurent Studio YSL 78-043, recorded 1933-34. Transfers by Yves St Laurent.